From 3 September, there will be big improvements to some routes, including Wear Xpress X5, Tyne Tees Xpress X9/X10 and Castles Express X21. There will also be some changes to a number of other services to help with reliability. A new hourly Sunday daytime service will be introduced on service X5, running the full route between Sunderland, Peterlee and Hartlepool, offering new travel opportunities. Working in partnership with Sunderland College, there will be additional journeys at peak times on weekdays between Sunderland and Peterlee, numbered X5A, which will run via Easington Colliery and Horden instead of Littlethorpe and Essington Way. There is an extra journey on weekdays from Doxford International to Sunderland, departing at 4.06pm. On Sunday daytimes, a full service X21 will now run between Bishop Auckland, Durham, Chester-le-Street and Newcastle, offering faster journey times to Newcastle. Buses also have great features such as USB Connections and free customer WiFi. Weekdays, the journey which commences from Chester-le-Street at 6.40am towards Durham will now commence from Gateshead at 6.20am. Weekdays there will be an additional evening journey from Newcastle to Washington, departing Eldon Square at 11.30pm. There will be some changes to the timetable on a Saturday – but no other changes on weekdays or Sundays. There will be an extra journey from Great Park into Newcastle in the morning peak, to provide more seats. The weekday journey which commences at Crookgate towards Stanley at 6.30am will now commence from intu Metrocentre at 6.16am. Weekday journeys which leave Stanley at 3.55pm and 4.30pm will be retimed. The journey at 3.55pm will run as service 8 instead of 8A. The morning peak timetable is revised. Journeys on service 11X will become a standard service 11. Any passengers travelling towards Cobalt are advised to change in Newcastle City Centre onto service 309 or X39, which serves Haymarket Bus Station and Sandyford Road, near the Civic Centre. Weekday journey at 3.54pm from Whitley Bay will be retimed to improve reliability. Weekday journey at 3.27pm from Durham to Langley Park is retimed ten minutes earlier, following changes to Framwellgate School finish time. Sunday timetable is slightly amended to improve reliability. Timetable revised to improve reliability. Extra journeys in the morning peak into Durham and Sunderland. On Sunday daytimes, service 20 will no longer serve Doxford International, giving a faster journey between Durham and Sunderland. Any passengers wishing to travel to Doxford International on Sunday daytimes can use Black Cats service 39 or new Sunday Wear Xpress service X5. Evening journeys on service 20 will continue to serve Doxford International. Due to low passenger numbers, this service will be cancelled. There will be minor adjustments to the timetable to improve reliability. For students and people visiting the bars and restaurants of Newcastle and Durham, this service will be extended from Durham North Road to Durham University, stopping on South Road for access to colleges, and also serving New Elvet and Leazes Road Underpass providing convenient stops. On Sundays, service X22 will be increased to run hourly, between Metrocentre and Chester-le-Street only. There are no changes to the service on Monday-Saturday – service X22 will continue to run to Durham on these days. Following passenger requests, journeys around the Docks will run clockwise and anti-clockwise. Once per hour, the service will run on the current route as service 33, and once per hour the service will run anti-clockwise as service 33A. Due to this, there will be some small changes to the times of service 33. There is no change to the route or frequency between Silksworth and Sunderland. There will be an extra journey from Ouston and Pelton to Chester-le-Street on weekdays, departing Ouston at 8.10am, arriving in Chester-le-Street at 8.31am. Sunday journeys are retimed to run around five minutes later. The Sunday service will have a revised timetable to improve reliability. On Sunday daytimes, passengers travelling to Easington Lane and South Hetton will now be able to use the improved Wear Xpress service X5, with a full service direct to Sunderland on Sunday daytimes, no longer needing to connect with service 35A at Houghton-le-Spring. Service X39 will no longer run to Gateshead – all journeys will now terminate at Newcastle Haymarket. Passengers for Gateshead are advised to alight at Haymarket and change onto one of a number of buses which run to Gateshead from Eldon Square Bus Station (which is adjacent to Haymarket). Minor amendments to timetable on evenings and Sundays to improve reliability. Departing from Sunderland at 6.33am, arriving in Newcastle at 7.38am. Departing from Newcastle at 7.42am, arriving in Sunderland at 8.46am. A small number of morning journeys will be revised to additionally serve Dalton Park to link with new X10, which provides links to Middlesbrough and Newcastle. The timetable of this service will be revised. 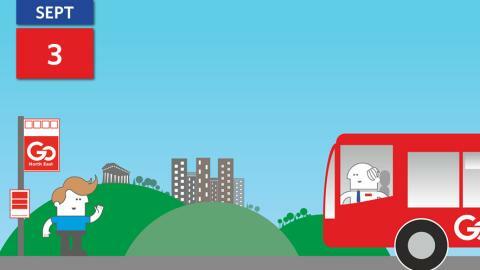 On weekdays, there will be more journeys between Gateshead and Metrocentre before 8.30am, to provide extra comfort and opportunities to travel. Weekday journey at 5.25pm from Sunderland is retimed to depart at 5.30pm. The times of these journeys will be revised, and most journeys will no longer be operated by Go North East. Please contact Nexus on 0191 20 20 747 for further details of the new timetable. Weekday afternoon timetable will be improved, with more journeys. The timetable of this service will be revised, with more journeys in the afternoon. There will be some small changes to the times of journeys to improve reliability.